"Grilled brats get a hot bath in beer with butter and onions for even more juicy and delicious flavor!" Prepare brats on a gas or charcoal grill according to package directions. 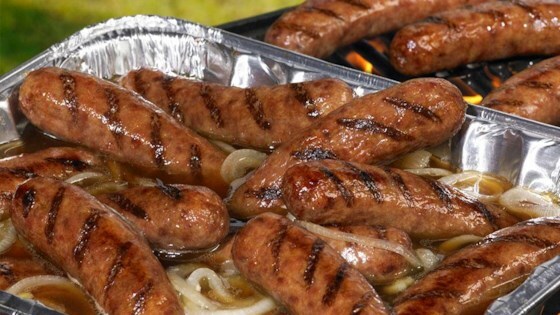 When brats are cooked, remove from grill and place in foil baking pan. Place pan on grill, add beer, butter and onions. Over medium heat, on a covered grill, allow brats to simmer in beer and onions. Serve each brat with onions on a bun. Enjoy! See how to make brats in a beer bath. Love this! I added red, green, and yellow peppers with the onions. This is the bomb!!!! Reminds me of county fair food.